When an old friend of mine announced his plans to visit recently, I told him that I’d make him sleep in the shed if he didn’t bring back the Blu-ray of Wanted that I loaned to him about four years ago. The shed is pretty ramshackle, and my friend would have had to share it with numerous chipmunks, skunks and swallows (or whatever the hell those birds are), so it’s a good thing he was as good as his promise to return this long-lost disc. He’s a good friend, but I might have followed through on my threat. I really like this clever, visually exciting movie. As soon as it returned to my possession, I was quick to rewatch Wanted, and it did not disappoint. The film is every bit as clever and exhilarating as I remembered it from the previous three or four times I’d seen it. This time around, though, I picked up on a few things that I hadn’t considered before. The first is that the character of Barry is played by a pre-megastardom Chris Pratt, an actor I’d thought I’d never seen on a screen before last summer’s Guardians of the Galaxy. (I see now that he was in Zero Dark Thirty, as well. Huh. Anyway.) Pratt is pretty funny in Wanted (the film may be a comedy in action-film clothing), but his presence in it is not the most interesting thing I noticed this time around. I found myself focusing on one of the film’s signature visual effects, the first example of which is easily viewable in the clip below. In this particular effect — which is, crucially, always used in point-of-view shots — the image goes wobbly in a way that resembles the ripples that are created by chucking a rock into a pond. This rippling effect is typically combined with a quick “punch-in” zoom that magnifies the image that, we understand, we’re seeing through the optical and mental subjectivity of a given character. In the clip above, the character whose mind creates this ripple effect is Mr. X, a suitably mysteriously named figure whose identity is reconfigured as the film progresses. The narrative situation that appears to bring about the ripples is that Mr. X finds himself in the sights of a team of snipers parked on the roof of a high-rise adjacent to the one he’s in. In the clip, Mr. X runs at full speed down the hallway, away from the window closest to the snipers, and furiously bangs the button to summon the elevator — in an apparent attempt to flee. But, as we soon see, he only called for the elevator because he knew that its five-foot depth would provide him with just enough extra room to gain the superhuman speed necessary to run back down the hallway toward the snipers. After that he will, utterly implausibly, burst through the glass, leap across the gap that separates the two towers, shoot three of the snipers from midair (killing one with a bullet that somehow bends around a wall of the building), bust through a window in the other tower and, without even breathing particularly heavily or mussing his oiled hair, climb a couple of flights to emerge on the roof, where he promptly dispatches the remaining snipers with a perfectly placed bullet. The scene is as breathless as the previous sentence, albeit far more exciting. Seconds after taking out all four snipers, Mr. X is himself killed, shot through the head with a weird, ornate, multistage bullet that is fired from all the way across town by an even more mysterious and talented assassin. As I said to my wife after we recently watched this film, the main thing I love about Wanted is the way it revels in its impossibility. The scene with Mr. X opens the film, and it sets the tone in more ways than one. Almost nothing in this exciting opening scene is physically possible, unless you count mundane actions such as walking and talking on a phone. Wanted celebrates this impossibility by going so far as to make it the crux of the narrative. That curving-bullet trick, which defies all known laws of physics, turns out to be one of the signature techniques of the ultra-elite assassins who are the film’s central characters. When we first see this effect, through the eyes of the gifted but unfortunate Mr. X, it seems like it might be a bit of a gimmick, an extra-narrative CGI fillip that director Timur Bekmambetov used to imbue his images with more excitement than they actually possess. But if we’re watching closely, this ripple effect gives us crucial information that characters’ actions and dialogue don’t reveal until much later in the film. When we meet Wesley, he’s a sallow office drone, as ineffectual a main character as we’re likely to meet — all the better to set up his transformation into an elite assassin. Wesley suffers from a terrible case of anxiety, a condition exacerbated when he’s berated, as he often is, by his boorish boss, Janice. When Wesley is bested by anxiety, he sees the world as if it’s starting to cave in on him, an occurrence that Bekmambetov conveys using the same ripple effect that he employed when Mr. X stared down the hallway toward the snipers who were trying to pick him off. Unusual as this effect is, the narrative context of Wesley’s anxiety attacks is sufficiently distinct from that of Mr. X’s top-flight gunmanship skills that it’s easy to miss the visual connection between these elements. Yet, as we learn later, the ripples link these two characters in a very important way: Wesley is the son of a Fraternity member, and has inherited his father’s superhuman ability as a marksman. What seemed to Wesley to be anxiety attacks for which he self-medicated are in fact the visual/mental manifestations of the intense concentration that is the hallmark of a Fraternity member. This unusual effect is not, after all, a visual lagniappe but a depiction of one of the protagonist’s most narratively salient qualities. A later scene confirms Wesley’s skills when a gun is put to his head and he’s instructed to use a pistol to shoot the wings off flies hovering above a garbage can. Faced with the choice of killing some flies or being killed himself, Wesley opts for the former, and surprises himself by accomplishing the seemingly impossible task. As he takes aim, we see the flies from his point of view, and, sure enough, pulsating ripples appear, suggesting both Wesley’s anxiety and his preternatural ability with a firearm. Indeed, in this scene we get visual as well as verbal confirmation that these two qualities are one and the same. 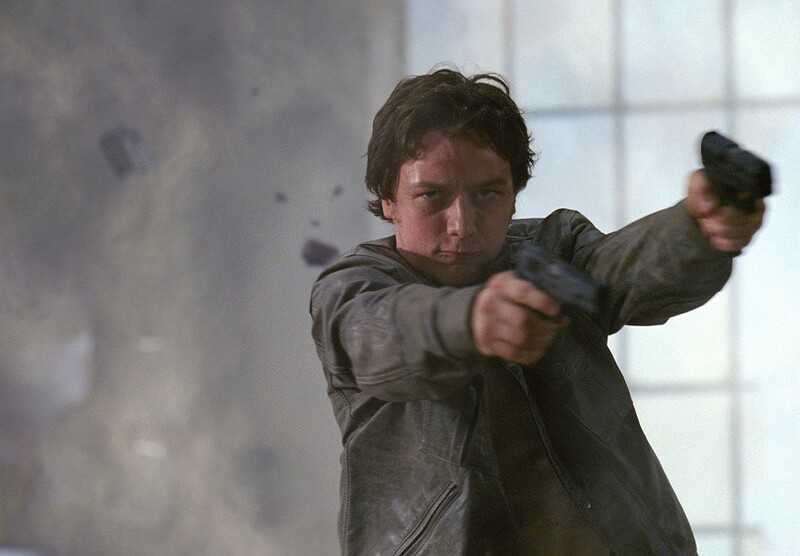 Never mind that shooting the wings off flitting flies, the action that solidifies Wesley’s status as a protagonist who can take action, is entirely impossible. As the opening scene shows, these assassins live in a world of rarefied abilities, in which standard human limitations and rules of physics do not apply — the curving bullet is, again, the central example, and the one on which the story hinges. Even if we take the ripple effect to be nothing more than a visual metaphor for the film’s characters’ abilities to concentrate intensely, it’s still something of an impossibility. No one actually sees things this way. In this wildly stylized film, the ripple effect is but the mildest form of physical impossibility. By preparing us to accept the even wilder impossibilities that follow in nearly every scene, this seemingly incidental effect serves another important narrative function. Which suggests to me that a closer viewing of Wanted would reveal other over-the-top visual devices that possess multilayered and — dare I say it? — subtle narrative functions, as well. Wanted is visually rich and dense and I strongly suspect it’s even cleverer than it appears on the surface. It's pretty hard to find a still from Wanted in which no one brandishes a gun.